We have just completed the renewal of the playground at King George V Playing Fields in Cuffley, Hertfordshire. 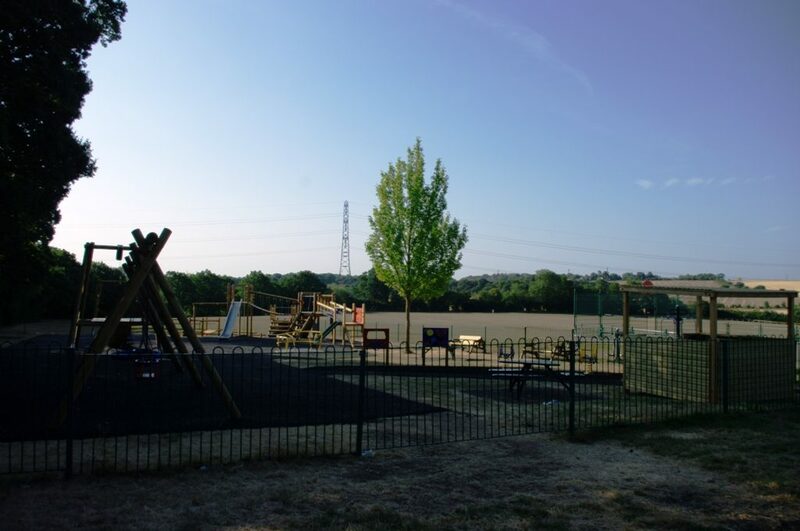 The brief was to remove the old, tired looking metal play equipment and disposal of this – then supply and install a large, fun, attractive playground suitable for use by children of all age groups. We designed the scheme to suit the natural surroundings, in using timber for the main play equipment – although there is the new metal Inclusive Roundabout, and HDPE Springers within the playground as well. This project was also the first to include our newly designed Ternary Tower Multi-Play Climbing Frame – which looks absolutely amazing installed with the surrounding safer surfacing. The 3 platforms are all different levels, so it encourages the younger children to progress from the smaller platform and make their way up to the central platform, and if they feel brave enough, onto the tallest platform at the end with the Stainless Steel Slide. The old Wetpour surfacing was covered over with our Earth-Tone PlayBond safer surfacing – and the Inclusive Roundabout had Green PlayBond installed around it. We also installed PlayBond over the existing tarmac path into the play area, and re-painted the existing metal picnic tables which were left in-situ. We are sure that you’ll agree that this playground now looks so much more refreshed then it did before, and the local children and visitors will enjoy their new playground for years to come.